The ICS Hygiene Center provides the opportunity for homeless men and women to wash clothes, take a shower and spend a few hours in a warm, safe and dry environment. The Center is open weekdays from 8:00 am to 2:00 pm, creating a welcoming environment to anyone who walks through our doors. Each weekday morning our industrial washer, dryer, and hot water heater are put to use, washing clothes and offering showers for 20 to 40 people. Once a week, we offer the option to wash larger items, including blankets and sleeping bags. Our Hygiene guests are given toiletries, such as razors, shampoo, deodorant, toothbrushes and soap. 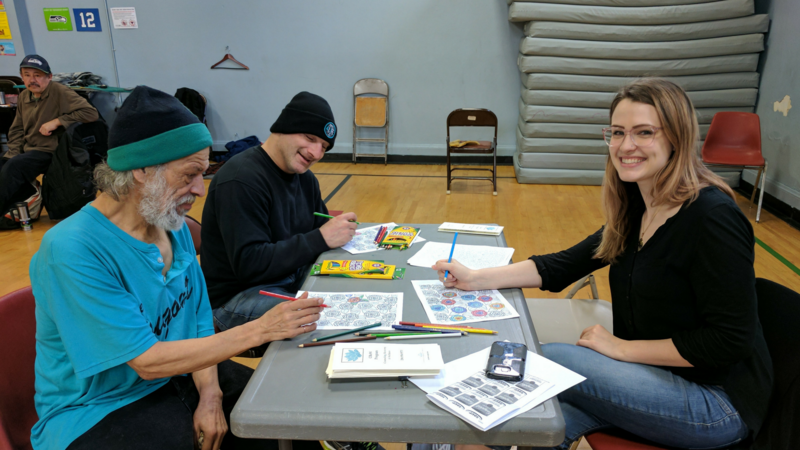 These essential services allow homeless individuals to participate in work, job search and community activities with dignity. Many local businesses, schools and organizations organize Hygiene drives for ICS. They collect small hotel sized toiletries and new, or lightly used, towels and wash cloths for the program. Some local businesses and churches who donate pastries and sack lunches to our guests to enjoy while they stay with us. Thank you to our supporters for helping us to care for those in our community who are homeless!